Braided hair decorated with ribbons and flowers, supple fringed shawls atop colourful embroidered blouses, generous A-lined skirts with ruffled hems… The look of Mexican painter Frida Kahlo, often inspired by traditional Mexican dress, is recognisable around the world. A new exhibition at the Victoria & Albert Museum in London, on display until November 4th, explores the complexity of Kahlo and her elaborate outfits. Thousands of documents, photographs, medicines, cosmetics, accessories and clothing belonging to Mexican painter Frida Kahlo stood untouched by her husband’s request in a bathroom turned repository for 50 years after her death. In 2004, the bathroom – located in Kahlo’s lifelong home, the Blue House – was reopened, and the precious objects therein unveiled to the public. Some 200 of these have now gone on display at the Victoria & Albert Museum’s Frida Kahlo: Making Her Self Up exhibition, offering unique insight into the painter’s personal life. The daughter of a German expat and a Mexican of indigenous and Spanish descent, Kahlo was proud of her mixed background and she felt a particularly strong connection to her Mexican heritage. Her mother was originally from the central state of Oaxaca, and Kahlo grew up seeing traditional attire from that region, particularly the ornate ensembles worn by Tehuana women. Her own experimentation with such clothes was first documented in a photograph taken in 1929 when, aged 22, she married Mexican muralist Diego Rivera in a simple long tiered dress and a rebozo – a long fringed shawl– over her shoulders. The Tehuanas are a matriarchal community from Tehuantepec, Oaxaca, known “for their intelligence, beauty, and bravery”.2 They are praised for their dressing up skills: they can be seen walking around their local markets wearing intricate costumes, often hand-embroidered or embellished by the wearer, carrying fruit and goods on lacquered gourds known as jicalpextles. Typical Tehuana attire consists of a crown-like braided hairstyle with interlacing ribbons, a huipil (a brocaded [pre-Hispanic] or embroidered [Spanish influenced] square-cut top), an enagua (a full skirt with waistband ties), and a bolán (an underskirt flounce with a ruffled hem). A white starched lace headdress –known as resplandor– is worn on special occasions. Some of these garments date back to as early as 200 B.C.E. and were known to signify power, status, and even military skill.3 Kahlo was drawn to the strong nature of Tehuana women, their clothes being a visual signifier of such strength. She had both practical and ideological reasons for borrowing their form of dress, and one of utmost importance was that of showing her Mexicanidad – Mexican identity ­– in times of political turmoil. Guatemalan cotton coat worn with Mazatec huipil and plain floor-length skirt. Museo Frida Kahlo.© Diego Rivera and Frida Kahlo Archives, Banco de México, Fiduciary of the Trust of the Diego Riviera and Frida Kahlo Museums. The Mexican Revolution began in 1910 – Kahlo famously claimed this as her year of birth – as a result of “social injustice and political restriction”.4 A collective of sympathising artists and intellectuals, including Kahlo and Rivera, promoted national values, culture and dress in rejection of European influence. 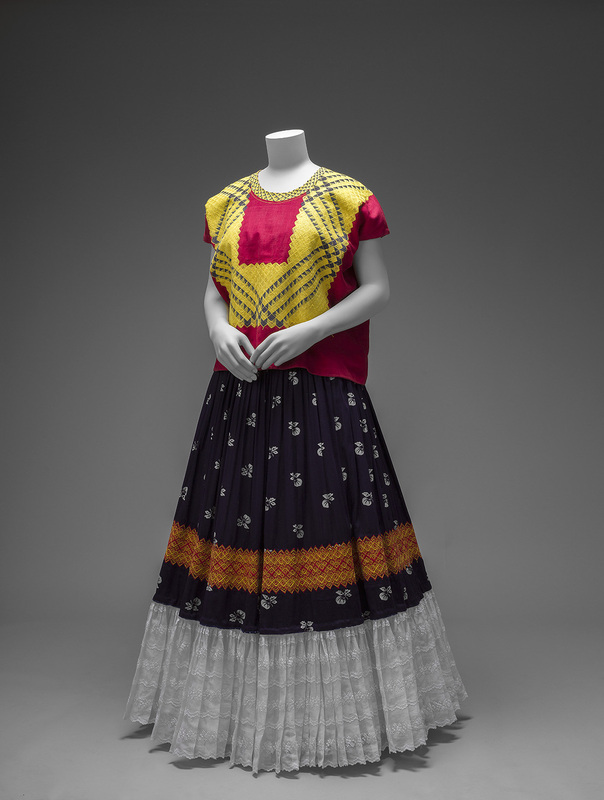 Kahlo in particular, through her typical Tehuana ensembles, helped to bring pride to Mexican identity while simultaneously establishing her own. The exhibition at the V&A includes 22 Tehuana garments, including a purple polka dot-printed huipil with orange embroidery, paired with a multicoloured and embroidered ceremonial skirt; a long four-lobed link chain necklace twisted to create a rope-like effect, known as torzales and formerly used in Oaxaca to display family wealth; and a white resplandor with pink ribbon depicted in Kahlo’s 1943 Self Portrait as a Tehuana painting. 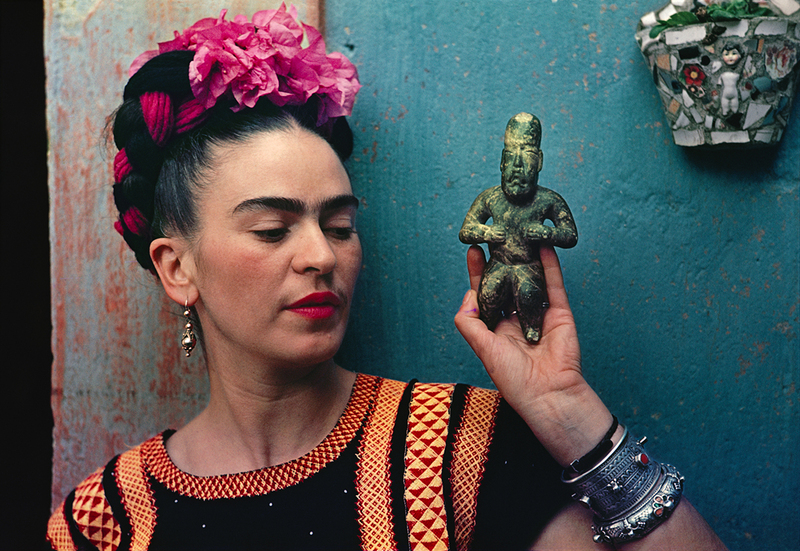 Pieces like these denoted a connection to Kahlo’s family roots and culture, but they also became elements of her self-constructed image to feel powerful, in control and attractive despite her emotional and physical ailments. For Kahlo endured significant pain in her life. She was bedridden for months at the age of six after contracting polio and, in 1925, she suffered a near fatal accident that left her with fractures in her spine, pelvis and right foot, as well as abdominal and womb, injuries that made her barren and insecure about her body. 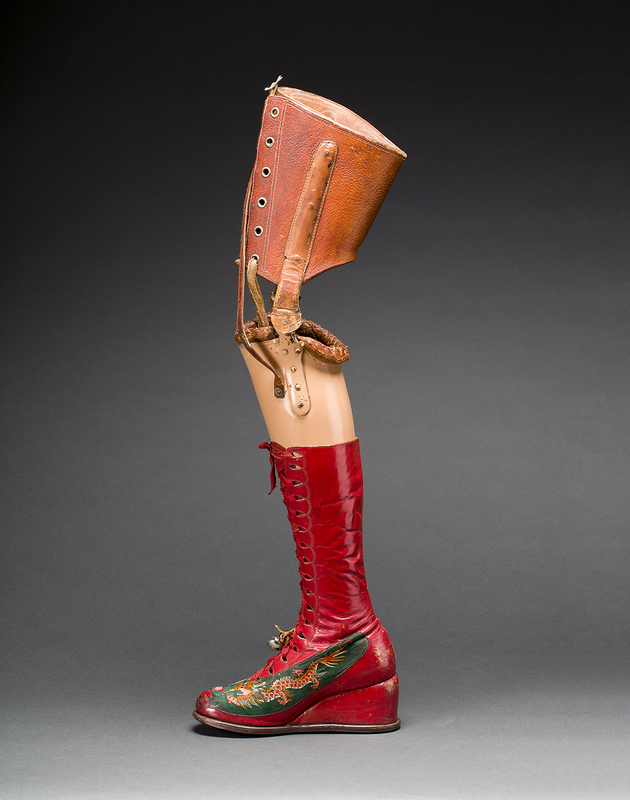 She was forced to use a series of objects to manage her condition, such as a plaster corset that Kahlo hand-painted herself with a broken spine surrounded with flowers and fruits, and a prosthetic leg with a pair of spellbinding red leather lace-up boots with Chinese-style embroidery and bells. Tehuana dress not only helped Kahlo project a sense of positivism despite her illness, but it also served as a distraction from her physical malformations. The loose-fitting and heavily decorated huipiles were spacious enough for her corsets to go unnoticed and pulled focus – along with the braided hairstyles – to her upper body, while the long flared skirts helped to hide her first deformed, then amputated leg. 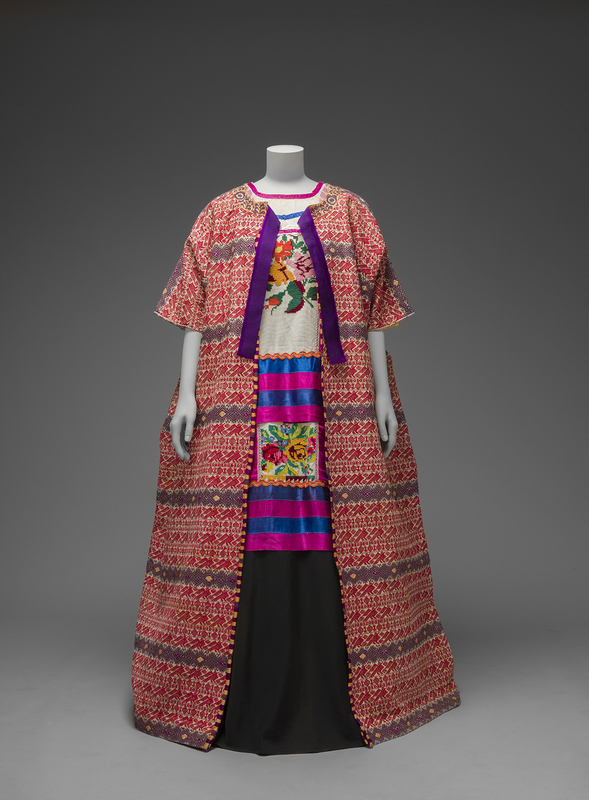 While Tehuana dress became representative of Kahlo, her style was eclectic and fused objects from places like Guatemala, China, Europe, and the USA. Through her kaleidoscopic taste, she juxtaposed traditionally feminine elements, such as flowers and makeup, with the less conventional features of a unibrow and moustache. Some of the exhibition’s pieces reflect this plurality of taste and style: a pair of gold-tone cat-eye sunglasses and a Revlon ‘Everything’s Rosy’ lipstick from the US, an embroidered Chinese skirt, traditional Guatemalan sashes, French opera glasses and shawls, and English cottons sewn as Tehuana-style garments. Kahlo once said: “I am my own muse. I am the subject I know best, the subject I want to know better.” In knowing herself better, she managed to endure tragedies – cheating, frustrated childbearing, and loss– to build a public persona and a career that has transcended her lifetime. The self-taught painter’s success extends to worldwide exhibitions, the demand for her paintings (some of them selling for millions of pounds), and to her status as Mexico’s most famous painter. Upon unveiling the exhibition, its masterminds Claire Wilcox, Senior Curator of Fashion at the V&A and Mexican curator Circe Henestrosa, said they “wanted to portray Kahlo, an inspirational woman, in the best way possible”. This involved an intense collaboration with the Blue House (now a museum devoted to the painter near Mexico City), and a deep immersion into Kahlo’s personal belongings. There is great risk in devoting an exhibition to a personality of this magnitude – one that has been celebrated over and over again via exhibitions, films, fashion shows and everyday merchandise –, even more so when a community’s traditional dress is being discussed. But there is also clear commercial gain in showcasing the personal life –not necessarily the work – of a deceased pop culture icon. The V&A’s expertise in capitalising from such legends –David Bowie and Alexander McQueen in recent years – is palpable, but so is its pool of knowledge, ambition and resources to assemble big scale exhibitions such as this one. This exhibition covers all facets of Frida Kahlo’s short-lived life, from her early years to her battles with illness and her romantic entanglements, devoting grand spaces to generous amounts of remarkable photographs and clothing. Its many rooms allow audience members to go on a journey with Kahlo, to empathise with her pain, to appreciate her creative expression, and to nurture a fascination with the woman she constructed. Kahlo was buried in an all-white huipil, her hair braided, her hands full of rings. Today she is a beloved symbol of Mexicanidad. Her Tehuana-inspired attire embodies a pride for traditional clothing in a world where native communities are regularly falling victims of abuse or neglect, and where their creative work is more often than not appropriated without credit or forgotten. In paying homage to the legend of Kahlo and to the culture behind her representative look, this exhibition helps to keep the sartorial richness of Tehuanas alive. 1 Sayer, C. (2010) Berg Encyclopedia of World Dress and Fashion. Volume 2: Latin America and the Caribbean. Edited by Margot Blum Schevill. Oxford: Berg. p 28. 2 Martinez Vidal, S. (2016) Frida Kahlo: Fashion as the Art of Being. New York: Assouline Publishing. p 74. 3 Sayer, C. (2010) Berg Encyclopedia of World Dress and Fashion. Volume 2: Latin America and the Caribbean. Edited by Margot Blum Schevill. Oxford: Berg. Page 23-26. 4 Sayer, C. (2010) Berg Encyclopedia of World Dress and Fashion. Volume 2: Latin America and the Caribbean. Edited by Margot Blum Schevill. Oxford: Berg. Page 23-26. 5 Martinez Vidal, S. (2016) Frida Kahlo: Fashion as the Art of Being. New York: Assouline Publishing. p 9.